Guest author Jonathan Frangakis is CEO and cofounder of Mira. Ad blocking isn’t the end of the world, it’s actually a new beginning—and smart app developers are poised to reap the benefits. Developers, rightly, pour resources into creating great experiences in their apps. But when it comes to advertisements, there’s a fundamental problem with the underpinning business model here. Invasive and ill-timed ads have become one of the most hated facets of the modern web. So disliked, and yet so deep rooted, it could even jeopardize the future of mobile app creation—as well as the free web as we know it. But for savvy developers willing to ditch the old approaches, it may be a golden opportunity. Ground zero for this threat is the ongoing disconnect between two things: the need for advertising as a monetization model, and the consumer desire to stand up against negative user experiences—including irrelevant, intrusive advertising. It almost feels like this is the year that users liberated themselves from ads.  And it seems like 2015 is when advertisers started taking the user’s desire seriously. We know this isn’t the case—ad blocking and no-track technology has been growing for years on the desktop, and we’ve seen advertisers lament the coming blocking wars for years as well, but the furor on both sides seems to be at fever pitch as 2015 draws to a close. Publishers, with revenues that have been in free fall since the early 2000s, have now realized that the ad-supported model we’re used to—webpages filled with auto-play videos, banners, display, hero units and sidebars—has to innovate or they’re going to go bust. After all, no one wants to work for free. But the last thing anyone wants is to be interrupted by annoying pop-up ads. Some advertisements take over your screen, and block you from doing your task. It’s common, annoying facet of modern life. You don’t want to be taken out of the experience, especially within the limited real estate on mobile—where a fat thumb tap can ruin your game of Trivia Crack. Accidental taps account for a large portion of in-app ad clicks, and the frustration, both from the advertiser and the user, is palpable. Ad blocking was created out of sheer necessity, and either we listen and take action, or the mobile app economy will continue to suffer. Sure, you may think browsers are the only place at risk, but innovation answers what consumers demand, and it may be here sooner than you think. Mobile apps may be immune to ad blockers today but technology is being developed that allows mobile network operators to block ads inside apps and browsers before they ever reach a mobile phone. When you consider 80% of the users surveyed here say they’re unwilling to pay for ad-free content, yet millions are blocking the ads that allow the content to be consumed for free, the future looks bleak for developers with a traditional mindset. We all deserve to be paid for what we create, especially when our creations are the backbone of the free web. In fact, users actually like ads that are relevant, valuable, and appropriately timed. It’s only when invasive ads that are poorly served, according to this research project, that sends consumer sentiment into irritation and anger. 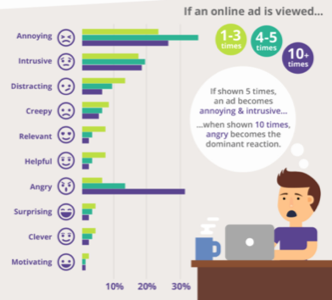 For instance, users viewing an ad five times become annoyed—users viewing an ad 10 times become downright angry. In the past 2 decades, the internet has allowed the mass propagation of free, amazing, life-changing content—and publishers and developers deserve to get paid for making something magical for our consumption. Creators are loved, but poorly monetized. The carriers are hated, but monetized better than an umbrella store in the rain. This dichotomy creates a puzzling result. While your favorite artist, developer and publisher is struggling to turn a profit, Satan’s children, the carriers we all love to hate, are making out like bandits for just funneling publisher content your way. They’re actually making more money selling data than publishers are making from ad monetization. In fact, this analysis finds you’re paying 16.6 times more for data than the top 50 news sites make from mobile ads! This is unbelievably backwards—and not sustainable. If developers and publishers are unable to monetize what they create, then the end of the free web is closer than we know. Let’s take a step back and return the focus to mobile for a moment. That’s where the battleground for attention lies, and much of that attention is hiding from advertisers. The fact that there are now more mobile-only internet users has been telegraphed for years. But what’s really turning heads is the velocity of the shift. Phones and tablets are now the primary way we access the web. For instance, smartphone usage has increased by 394% while tablet usage is up 1,721%. 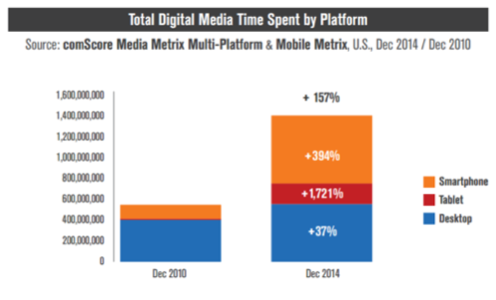 Even more important in terms of monetization is the mobile user’s behavior; the browser is out and the app is in. Applications are the kings of the mobile web—it’s all about the UX. Research reveals mobile users spend as much as 86% of their time in-app. 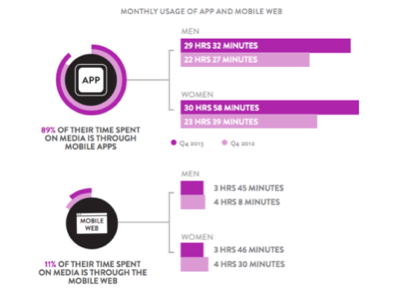 Put another way, this research estimates users spend up to 29 hours per month inside mobile applications. 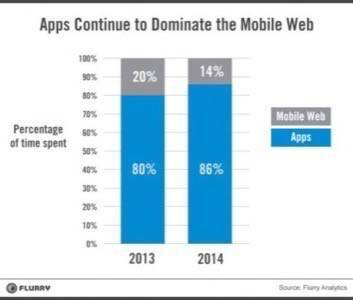 In other words, users are walling themselves off from the mobile web, holing up inside applications. Unless you have deep pockets like Google, which pays million of dollars to circumvent ad blockers to allow its ads to squeeze past, targeting ads to users on a mobile web browser will become increasingly difficult. Mobile screens are just too small and users will no longer tolerate irrelevant, ill-timed, and intrusive ads that clutter limited mobile real estate. Where does that leave the developer, 64% of whom earn less than $100 a month from their creations? Actually, developers are in a much better place than those clinging to the outdated mindset. Ad blocking is actually a positive when you consider that it forces us to step back, and create an app UX that purely delights. In-app ads are the wrong monetization. They’re shown at the wrong time and the wrong place to garner user attention. They’re not lucrative nor compelling, thus making them an unsustainable monetization model. While developers must find a way to be compensated for their work, users deserve an interruption-free in-app experience. True innovation isn’t charging for apps, offering in-app purchases, or stuffing relatively tiny pauses into an app experience with native ads. I think we forget what it’s like to be a user, and our attempts to “fix what is broken” stay too closely inside the existing system to be meaningful. A great example of this is a sports app I recently read about. Lauded for its innovative native ad pop-ups during timeouts and halftimes, the app’s ad experience runs on the notion that gamers who’ve played hard may be eager for a rest. So it uses the time to force feed them ads. For me, the jury’s still out on this approach. Interrupting a (hopefully) compelling app experience to advertise is the wrong tack. It’s bad for the user, worse for the advertiser—and the developer forfeits his livelihood. The mobile app should be ad free, but that doesn’t mean it has to be un-monetized. The opposite is true. Think about what you do have in the mobile experience: You have proximity, and you have the ability (with the right technology) to target users based on behavior. Take those two pieces of gold, and you can monetize without UX impact. The only way to preserve and grow the free web is to change how and when ads are served. True innovation requires plucking ads from mobile devices and serving them in a smart way: at times and in places that are desirable and valuable to the user. It means understanding the user in his or her mobile life, and using that information in the physical world to add value and respect privacy.